Boyle Heights residents took-up brooms and rolled-up their sleeves last Saturday to clean the neighborhood and help paint a mural at the Wabash Recreation Center. EGP photo by Gloria Angelina Castillo Residents of all ages from the Wabash neighborhood came out to build community and promote safety through the hands-on beautification project. According to Isela Gracian of the East Los Angeles Community Corporation, the organization’s Neighbors Building Neighborhoods (NBN) Committee gave their time and their heart to help beautify the recreation center’s exterior walls located near the basketball courts and playground. A series of dream like scenes, the mural was designed by artist Wenceslao Quiroz. According to the mural description, the scenes include the image of a Native American dream catcher depicted as a constellation of stars, followed by an illustration of people holding hands around a Ceiba tree and the Mayan tree of life. The image that follows the tree of life is of a Mayan mythological goddess Ixchel, who is carrying “an upside-down womb vessel in her hands which represent the nourishing gift of water and creation.” A fisherman casting a net is in the next scene, with “zombie-like” kids playing videos and trapped indoors. Next, the water pressure from Ixchel’s vessel rips through the fisherman’s net, allowing the fish to work towards the goal of progress and unification. 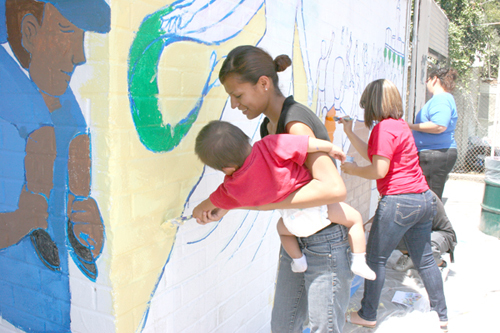 The mural is one of many elements in the Let’s Activate! Project, which resulted from more than 600 signatures collected in a 6-week period last summer to solicit funding. The $25,000 project includes free weekly exercise classes, which have already begun, the mural, new basketball courts and benches. The project is funded by the Community Beautification Grant from the City of Los Angeles, grants from the Youth Opportunity Movement, the Los Angeles Neighborhood Initiative, the United Latino Fund and ELACC matching funds, according to Gracian.